I am so excited to do my first product review and we’re starting with an amazing set! 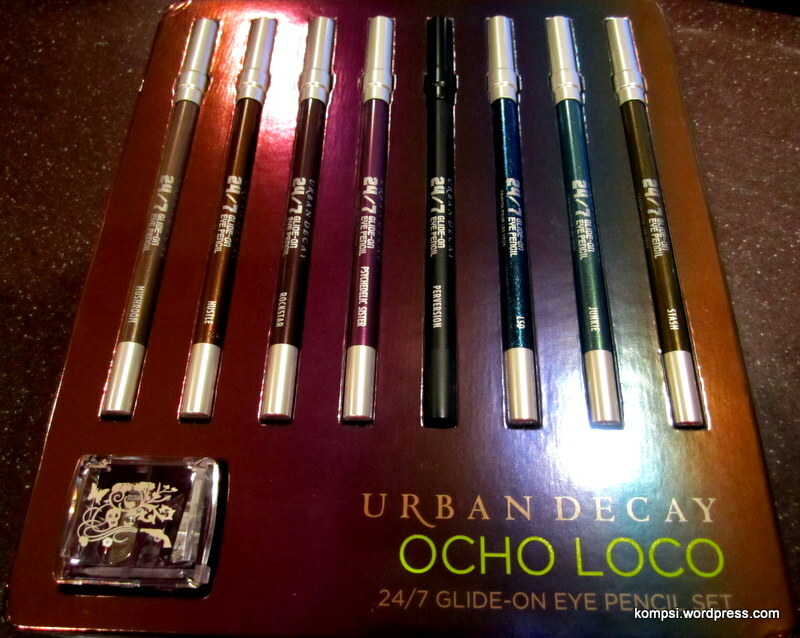 It’s Urban Decay’s Ocho Loco 24/7 Glide-On Eye Pencil Set, one of UD’s incredible holiday sets. I just received mine in the mail the other day and I’ve managed to keep it all in tact just so I could photograph and give it a proper review just for ya’ll. So let’s get to it! First of all, I must say that Urban Decay is one of my all-time favorite makeup brands. I’ve been an avid fan and user since I was a junior in high school, which was 11 years ago (omg!). Their products are not only beautifully packaged, but they have unusual colors, lots of shimmer and glitter and it’s afford-ably priced! Best of all, their products are seriously high quality. 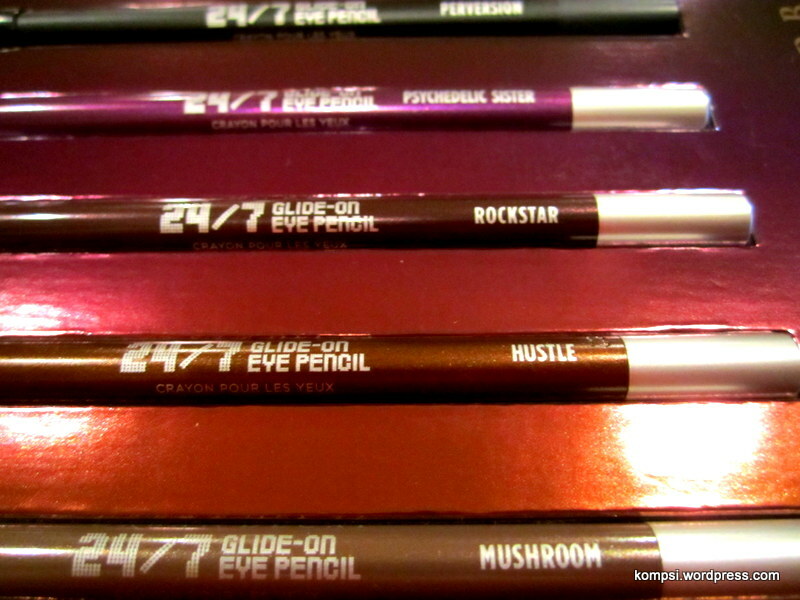 I’ve been using the 24/7 Glide-On Eye Pencils for a while, but I had never bought a full-sized or a set. I’ve purchased many palettes in the past that always have one or two pencils and as I’ve used them, I really like them. They are true to their name in that they just glide on, with nary a drag and the staying power is pretty good too, with good smudge-ability. What made me want to purchase the Ocho Loco set is that I loved the colors and they are all full-sized pencils. They are truly gorgeous and are all shades that I would wear regularly. Also, four of the eight shades are brand new and exclusive to the set! That’s always a plus with me. Lastly, the sets rounds out with a Grindhouse pencil sharpener. The set runs for $59 and can be purchased here. That may seem like a lot for eye pencils, but UD’s run for $19 each and this set includes EIGHT. It works out to about $7.30 per pencil and that doesn’t even include the sharpener. 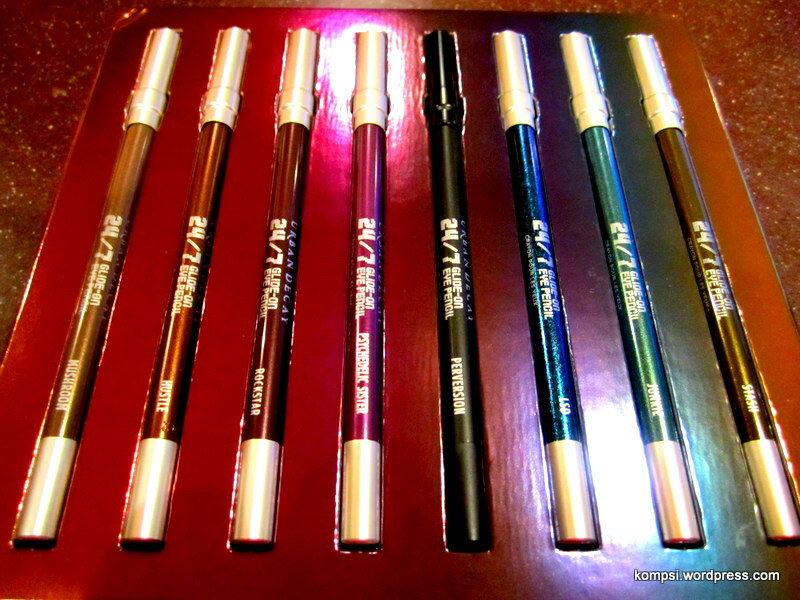 A regular drugstore-brand eyeliner (such as Revlon or Maybelline) is about $7.50. Look at those pretty colors. Grindhouse pencil sharpener, can’t have too many of those, amirite? 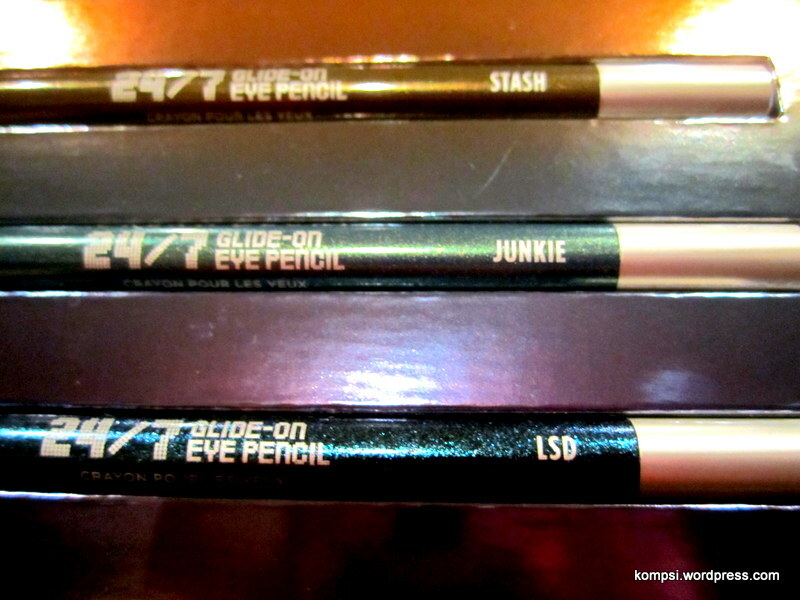 Mushroom* (taupe-pewter metallic); Hustle* (medium brown metallic); Rockstar (darkest eggplant); Psychedelic Sister* (bright purple shimmer); Perversion (blackest-black matte); LSD* (navy with bright turquoise shimmer); Junkie (teal with bright gold shimmer); and Stash (dark green/gold). Pretty, right? Right out of the package, I love Rockstar and LSD. 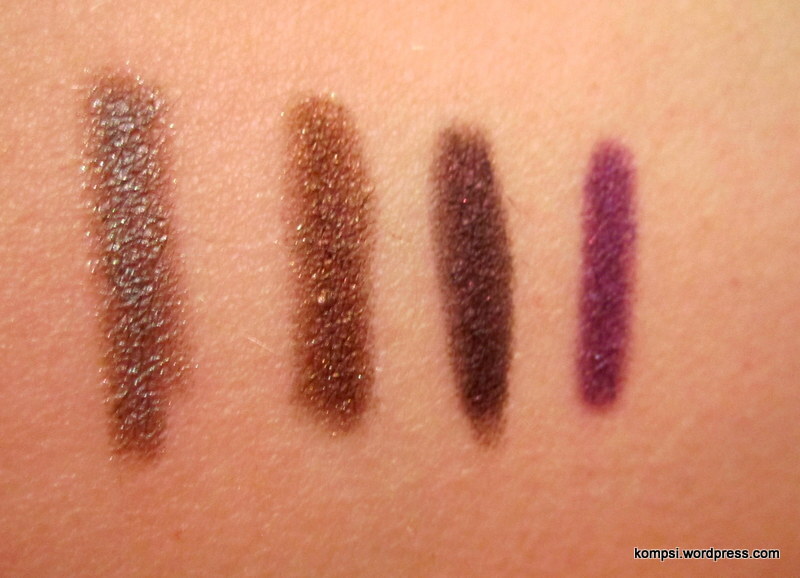 I have Rockstar in eyeshadow form and it’s just the prettiest shade of dark purple. On to the swatch samples! I mean, ya gotta see what it looks like on skin, right? 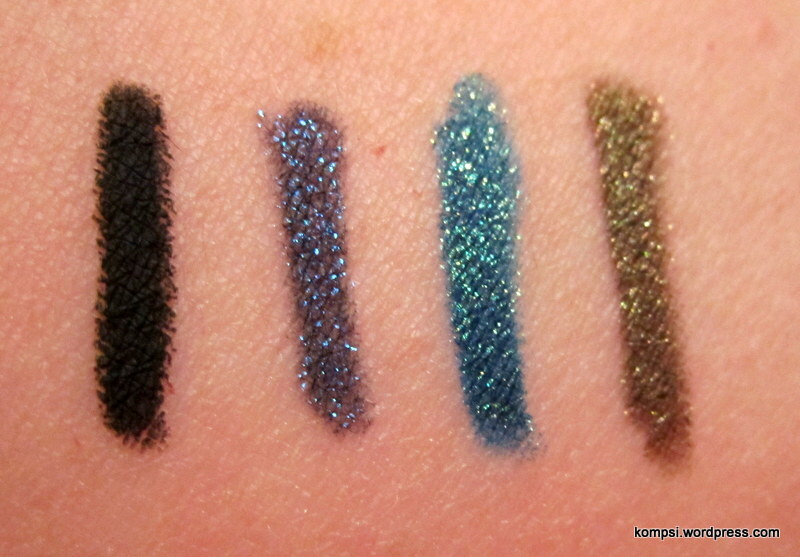 As you can see from the first swatch, these aren’t super crazy colors and can be easily worn day to night. 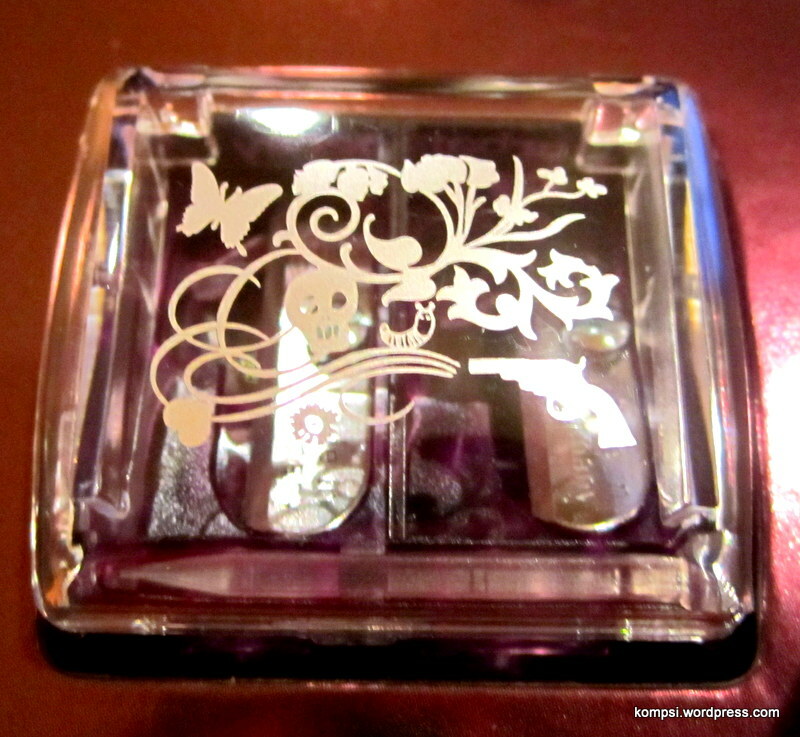 The second swatch is a little more wild, but definitely still wearable. 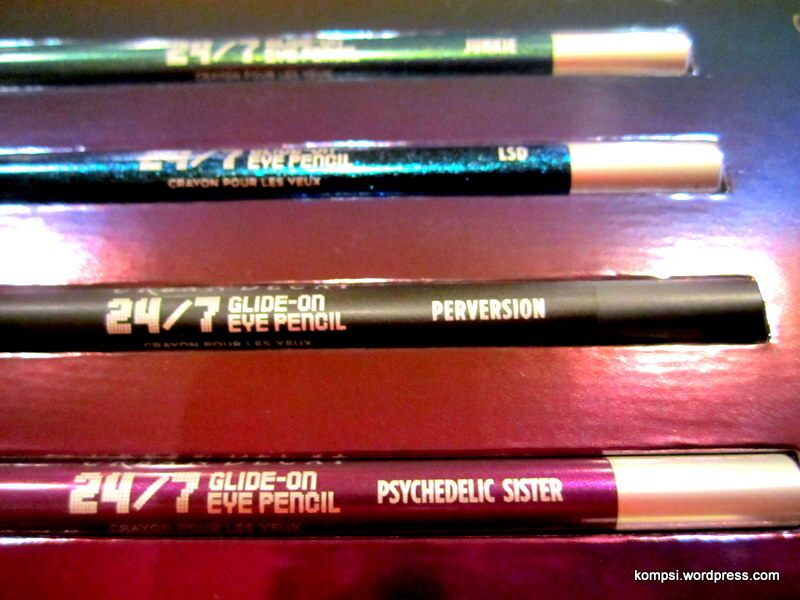 I LOVE Perversion, it’s going to be great to use for a smokier look with its matte finish. I can’t wait to really get in and try these out, especially with UD’s Vice Palette (which is going to be reviewed next!). I’ll be posting makeup looks and tutorials as well on this blog, so stay tuned! Urban Decay’s The Vice Palette Preview!